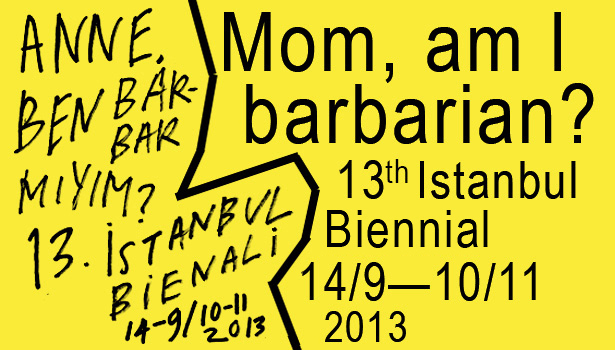 13th Istanbul Biennial: Mom, am I barbarian? Curator of the 13th Istanbul Biennial Fulya Erdemci announced the title of the biennial, which will be held from 14 September to 10 November 2013 by the Istanbul Foundation for Culture and Arts (İKSV) under the sponsorship of Koç Holding. The title and conceptual framework of the 13th Istanbul Biennial was announced by its curator Fulya Erdemci on Tuesday, 8 January at a press meeting which was held at the Maçka Campus of Istanbul Technical University (İTÜ). Bige Örer, Director of the Istanbul Biennial, joined Fulya Erdemci as a speaker at the press meeting. Fulya Erdemci, who determined the title of the 13th Istanbul Biennial as “Mom, am I barbarian?” with a reference from poet Lale Müldür’s book of the same title, explained the conceptual framework. At the press meeting, Fulya Erdemci announced that, as an exhibition in a dialogue with the city, the 13th Istanbul Biennial’s focal point would be the notion of the public domain as a political forum. According to Erdemci, this highly contested concept will serve as a matrix to generate ideas and develop practices that question contemporary forms of democracy, challenge current models of spatio-economic politics, problematise given concepts of civilization and barbarity, and most importantly, highlight the role of art in this context. Questioning what the reintroduction of the concept of “barbarian” as a reflection of “absolute other” reveals in our contemporary society, Erdemci referred to art’s potential for engendering new positions and constructing new subjectivities for the sake of creating a space for the weakest ones and the most excluded by destabilising dominant and deep-seated discourses. Erdemci further explained that the Istanbul Biennial aimed to highlight the potential of the discourse of public domain through an examination of spatial justice, art in the public domain and art-market relations. Aspiring to open new avenues for thought and imagination, the Istanbul Biennial will activate social engagement and public fora to generate a possibility for rethinking the concept of “publicness”. The 13th Istanbul Biennial will use public buildings which are left temporarily vacant by urban transformation as exhibition venues. These may include public buildings such as courthouses, schools, military structures or post offices, former transportation hubs like train stations, ex-industrial sites such as warehouses, dockyards as well as the very contested Taksim Square and Gezi Park. Furthermore, the hallmarks of current urbanism such as shopping malls, hotels and office-residential towers are being considered as sites for artistic interventions. Bige Örer also disclosed the details of the 13th Istanbul Biennial Public Programme, which will start in February as a part of 13th Istanbul Biennial. Aiming for bringing artistic production and knowledge production together, the public programme, titled “Public Alchemy,” is co-curated by Fulya Erdemci and Dr. Andrea Phillips, Reader in Fine Art in the Department of Art, Goldsmiths, University of London and Director of the Doctoral Research Programmes in Fine Art and Curating. A series of lectures, workshops, seminars and performances, which will take place from February to the end of the Biennial, will examine how a political, poetic alchemy is at work, both in Turkey and across the world, in which conventional concepts of “the public” are being transformed. The first events of the programme will focus on Istanbul’s current urban transformation under the title of “Making the City Public” from 8 to 10 February. Additionally, as a part of 13th Istanbul Biennial events programme, a special selection of films will be screened at the 32nd Istanbul Film Festival to be held in 30 March – 14 April. The Istanbul Biennial film screening programme will articulate the concepts of barbarity, civic awakening and the city. After the meeting organised with the participation of the press and the contemporary art professionals, curator Fulya Erdemci and the Director of Istanbul Biennial Bige Örer answered the questions. Public programme co-curator Dr. Andrea Phillips was also present in the press meeting.